With over 329 million members, LinkedIn can provide invaluable networking opportunities for professional services firms. Since it is a social network geared specifically to business professionals, LinkedIn users don’t have to battle the private and public persona struggle that other sites like Facebook or Twitter can create. Users can join industry-specific groups and connect with others in their niche without having to worry about a newsfeed filled with photographs of their followers’ children. LinkedIn isn’t just a great networking tool—it can also be the perfect platform for B2B social media marketing. Even though LinkedIn maintains a professional environment, it’s still all-too-easy to make social media blunders. Luckily, all of our top seven LinkedIn mistakes are easily corrected once realized. Are You Making Any of These 7 LinkedIn Mistakes? Perhaps the biggest mistake is to avoid LinkedIn altogether. We asked 1,028 buyers of professional services how they check out potential providers and nearly 60% reported using social media. 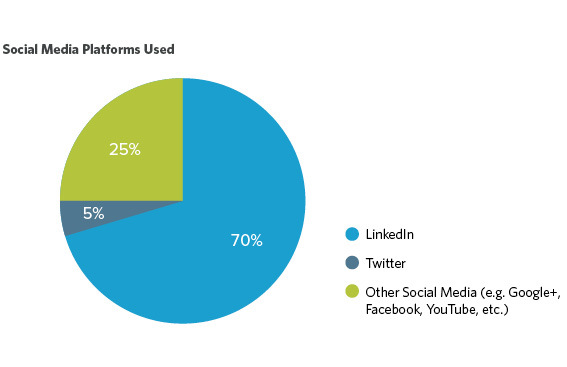 And the top social media network those buyers are using to research prospective firms is overwhelmingly LinkedIn. If you’re one of the last social media holdouts, it’s time to throw in the towel. LinkedIn is no longer merely a passing social media fad. In fact, it has quickly become the premier professional social media networking tool. Just like you would want to create a positive first impression when networking with a potential client face-to-face, it’s equally important to put forth a positive first impression on LinkedIn. Your LinkedIn profile isn’t just an online resume—it’s a hub where you can showcase your expertise, your specialties and credentials, highlight past projects, discuss causes you’re passionate about, and even express your personality. It should clearly communicate the value you’ve brought to the firms you’ve worked at and how you can help future clients. Put your best foot forward and fill out your profile as completely as possible. LinkedIn Groups are a great way to network with other industry professionals, show your thought leadership, and engage about trends and news. By joining Groups that are relevant to your industry and specific interests, you can boost your connections and uncover potential prospects. Once you join a Group, it’s important to remember that it isn’t all about you. Other members of the group will be quick to tune you out if they realize you only talk about yourself or your firm. Instead, follow the 80/20 rule. Make 80% of your posts about other relevant topics or as part of your participation in an active discussion and only allow 20% to be self-serving. Whether you’re posting in your groups or updating your own status, avoid coming across as overly self-promotional. This can be a turn off to people (and can even get you banned from a group!) and cause them to write you off before you even get a chance to demonstrate how valuable your product or service may be. The best way to avoid this mistake is to focus on building relationships first. For instance, when you are connecting with a prospect, begin by sending them a warm greeting and a piece of educational content that they may find helpful. This can help earn their trust while simultaneously showcasing your firm’s capabilities. LinkedIn makes for an effective business development tool. You can use it to drive more traffic to your website by sharing relevant content and establishing your profile as a valuable resource. When your connections begin to see you as a trusted expert in your industry, they’ll be more likely to invest that same confidence in your firm and services. On top of establishing your own personal presence on LinkedIn, your firm should also have a company page. When appropriate, you can even use Showcase pages as a way to organize your information. Don’t be afraid to let people know your firm is on LinkedIn and encourage them to like your page so they can stay up-to-date on your company. Since buyers are relying so heavily on your firm’s online presence when checking out their options, it’s crucial that your firm’s LinkedIn profile is a strong representation of what you have to offer. Don’t allow these rookie LinkedIn mistakes to derail your social media marketing efforts. And if you’re guilty of committing a few, don’t worry—it’s never too late to get it right. Just make sure your profile and your firm’s company page accurately showcase your skills, experience and how you can help clients. To learn more about how your firm to create a powerful LinkedIn strategy, check out our free LinkedIn Guide for Professional Services Executives. On LinkedIn? Join us on LinkedIn and in the Professional Services Executive Forum.